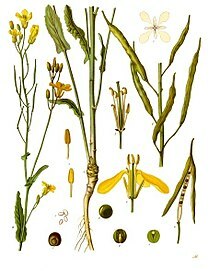 Raps (Brassica napus) is a bricht yellae flouerin member o the faimily Brassicaceae. Raps is growen for tae mak ainimal fother, vegetable ile for humans an biodiesel fuel. ↑ "Brassica napus information from NPGS/GRIN". www.ars-grin.gov. Retrieved 2008-03-27. This page wis last eeditit on 13 Mey 2018, at 02:17.